Grant Street Station Apartments provide on campus furnished apartments located at corner of South Grant Street and Harrison Street, West Lafayette, Indiana. Apartments are located on floors 2-6, and the 1st floor has a common area with car parking both sides. There is also a basement level that furnishes car parking. The project entailed constructing single bedroom apartments on an existing parking garage level on the 1st floor on either side of the common core area, for a total of nine (9). 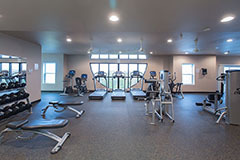 While also relocating the fitness room located on 6th floor to 1st floor, and converting the 6th floor to a deluxe 2-bedroom apartment. Project start date was end of the 2014-2015 school year and had to be completed by start of 2015-2016 school year without excuse. We had to place a concrete top slab over an existing parking garage to a level service to construct the units on the first level. We also had the coordination of fire protection, plumbing, HVAC and electrical services through existing precast concrete structural systems. We also needed to convert the 6th floor fitness room to a deluxe unit while subsequent floors remained occupied, while relocate plumbing, HVAC and electrical services on 6th floor to accommodate the new apartment layout. 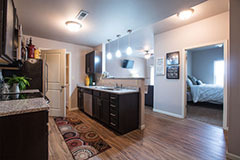 Each challenge was overcome through proper planning, scheduling, communication, and cooperation between Owner, Property Manager, Subcontracting Team, and Tenants. Weekly project meetings took place addressing issues of concern, resolutions, and a look head schedule to maintain focus and planning while holding each party accountable to hitting their respective deadlines.